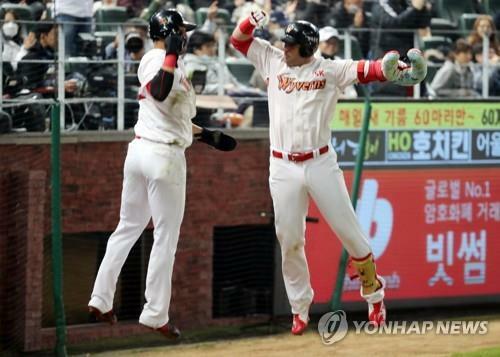 INCHEON, Nov. 7 (Yonhap) — Powered by three home runs, the SK Wyverns defeated the Doosan Bears 7-2 to take a 2-1 lead in the Korean Series on Wednesday. 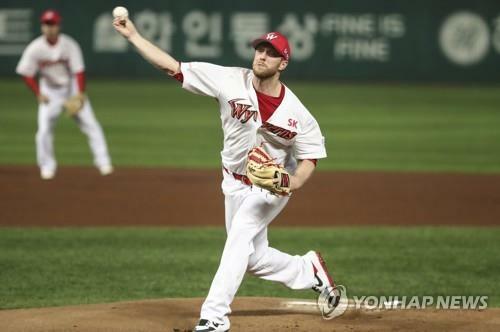 Cleanup Jamie Romak smacked two of the three homers and knocked in four runs, and starter Merrill Kelly tossed seven solid innings for the victory at SK Happy Dream Park in Incheon, just west of the capital. Team captain Lee Jae-won chipped in a two-run homer in the three-run eighth inning. Game 4 of the Korea Baseball Organization (KBO) championship series is back at the same stadium at 6:30 p.m. Thursday. Game 5 will also be here on Friday and Games 6 and 7, if necessary, will be back at the Bears’ home in Seoul, Jamsil Stadium. The Wyverns are pursuing their first championship since 2010, while the Bears are going for their third title in four years. 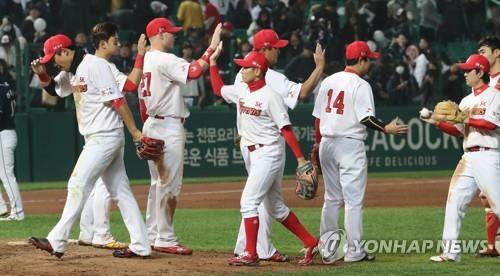 This is the Wyverns’ eighth Korean Series appearance, and they have never lost a Game 3. Romak set the tone with a three-run homer in the bottom first, and with the Wyverns nursing a 4-2 lead in the eighth, the Canadian provided an insurance run with a solo shot. Kelly gave up just two unearned runs in seven innings while allowing only four singles and striking out five. Romak was named the Player of the Game, but SK manager Trey Hillman said Kelly also played a huge role in the win. The Wyverns led the league in home runs during the regular season with 233, and in three games at home in the previous playoff series, they launched 10 homers. And true to form, the Wyverns got on the board first with the benefit of a long ball. 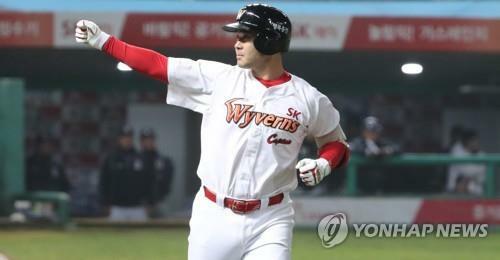 With two runners on, Romak jumped on a 2-0 fastball from starter Lee Yong-chan and drove it deep into the seats in left-center field, giving the Wyverns a 3-0 lead. It was Romak’s first home run of this series and his third in the postseason. After falling behind in the count, Lee threw a belt-high fastball over the plate — right in Romak’s wheelhouse. The Wyverns took a 4-0 lead in the bottom second, thanks to Han Dong-min’s infield single. With two outs and men at the corners, Han hit a grounder toward the hole up the middle. Second baseman Oh Jae-won dove to his right to keep the ball on the infield, but Han beat Oh’s throw to first with a head-first slide, as Kang Seung-ho scored from third. The Bears cut the deficit in half in the top of the fifth, capitalizing on a field error by shortstop Kim Sung-hyun. Yang Eui-ji led off the inning with a grounder deep into the hole in left, and Kim — who made two fine plays earlier in the game — bobbled the ball and never made the throw. Yang moved to second on a groundout, and Kim Jae-ho knocked in the Bears’ first run with a single to left. That was Doosan’s first hit off Kelly. Another groundout advanced Kim Jae-ho to second base, and he came home on Oh Jae-won’s single to left. Both of the runs were unearned for Kelly. The Bears wasted a bases-loaded opportunity with one out in the sixth inning, as they were unable to take advantage of an SK error this time. With one out in the inning, second baseman Kang Seung-ho failed to field the grounder by Park Kun-woo. Choi Joo-hwan’s single put the men at the corners, and Yang Eui-ji drew a walk to load the bases. Oh Jae-il, who was 5-for-11 with a home run against Kelly during the regular season, hit a weak comeback to the pitcher. After fielding the ball while moving toward the first base line, Kelly turned around and made an accurate throw home to get the force. Kim Jae-ho then flied out to shallow left to let Kelly off the hook. The Wyverns gave themselves plenty of breathing room in the eighth inning. Romak led off with a solo home run off Park Chi-guk for a 5-2 lead, and chased the reliever. Na Ju-hwan followed with a pinch-hit single off new pitcher Jang Won-jun, who was pulled immediately for Kim Seung-hye. Lee Jae-won then greeted Kim with a two-run homer to left-center for a 7-2 advantage. SK reliever Kim Tae-hoon, who took over from Kelly in the eighth, recorded five outs before allowing back-to-back two-out singles in the eighth. Jung Young-il came on and needed only two pitches to retire Jung Soo-bin to close out the game. The Bears were without their usual cleanup hitter, Kim Jae-hwan, who suffered an oblique injury during pre-game batting practice and was removed from the starting lineup. Choi Joo-hwan, who had gone 5-for-7 with six RBIs in the first two games, moved up from sixth to the cleanup spot, but went 1-for-4 in this one. Doosan’s No. 3 hitter, Park Kun-woo, was 0-for-4 with a strikeout. He’s 0-for-12 for the series.